The satisfaction people derive from connecting with the past never gets old. This fact wasn't lost on Old Point National Bank when it built its new 54,000-square-foot, six-story corporate headquarters and full-service branch in Hampton, Virginia. Opened in early 2014, the building greets visitors with a pair of identical custom-made, balanced doors bearing both traditional design and modern capabilities. They provide the statement of elegance, durability and effortless functionality that one expects from Ellison Bronze, the company that invented the balanced door. 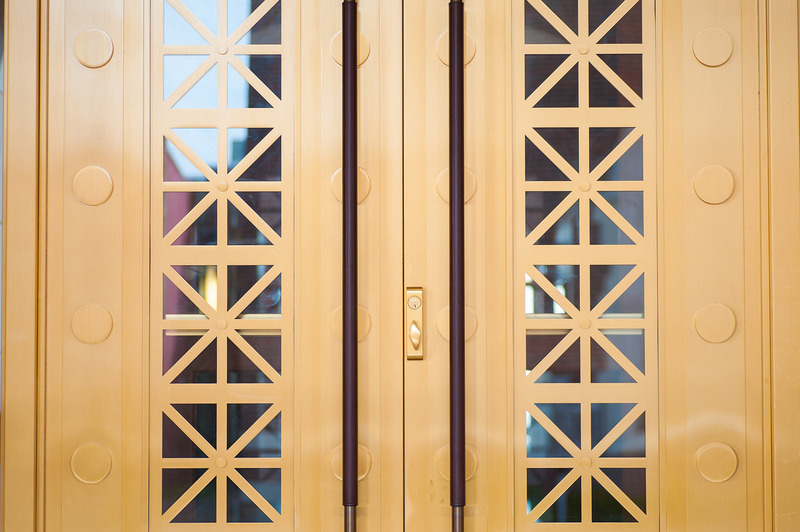 The Muntz bronze doors complement the building's early 20th century aesthetic and will last long into the 21st century. 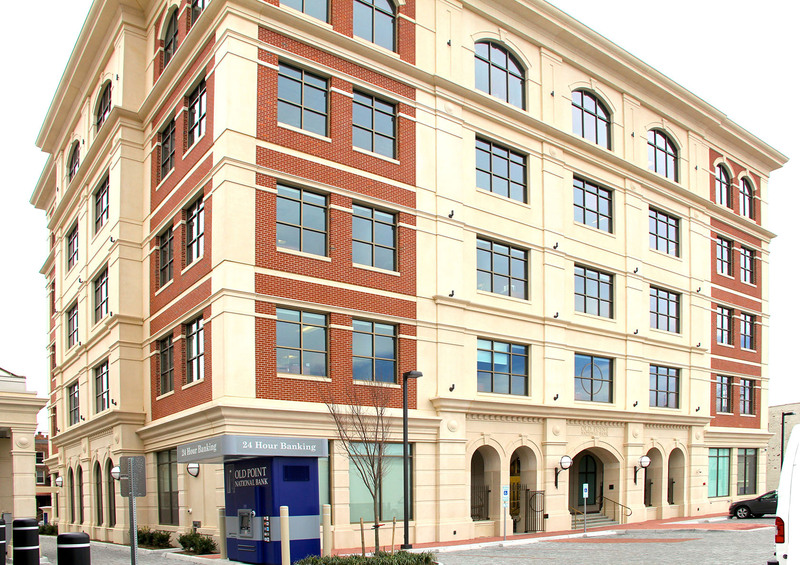 The building's vintage style pays homage to Hampton's early American origins as a seaport town. Founded in 1923, Old Point National Bank was named after the Old Point Comfort Lighthouse, emblematic of the bank's commitment to being a steady, trusted resource in all kinds of economic conditions. Old Point now boasts 18 branch offices and an array of state-of-the-art platforms, products and services. The first step the bank took in creating its new headquarters was to invite archaeologists onto the building site to conduct a voluntary excavation. The archeological dig yielded more than 1,000 unique artifacts, dating as far back as the 17th century. Several of the discoveries are now featured in the lobby of the new building. The bank also installed its own piece of history: an intricate 12-ton polished steel vault door purchased in 1924 and used at the company's first location. A local nonprofit, Preservation Virginia, honored Old Point for its commitment to Hampton's heritage with the Outstanding Preservation Research Effort award. These efforts also played a role in Old Point being recognized as the 2011 Best Sustainable Project by Virginia Business magazine. The building project was replete with historical markers. The official groundbreaking in 2011 coincided with the City of Hampton's 400th anniversary, and Ellison Bronze celebrated its centennial in 2014. 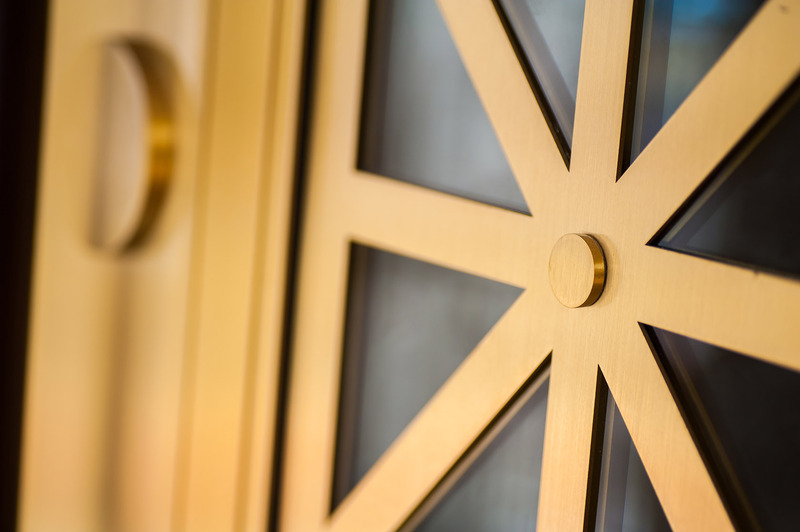 Each of the Ellison Bronze doors at Old Point's new headquarters blends monumental stile and rail construction with traditional early 1900s aesthetics, including bronze grillwork and large, circular discs. The discs measure 4" in diameter by 1/2" thick and are applied to the perimeter of both the exterior and interior door faces. The surrounding bronze framing is equally impressive and era specific, featuring a four-light arched transom with a single sidelight at each side of the doors, all set into the stone opening. The custom door and frame construction sports a #4 satin lacquered finish. Although heavy and durable, Ellison Bronze doors are effortless to operate. A balanced door features an inset pivot point at two-thirds the width of the door, creating a balance that distributes the weight so the door requires little force to open. The inset balancing point allows for an easier and ADA-compliant open force, even against external winds and internal building stack pressure. The doors at the Old Point National Bank headquarters might gesture to a bygone time, but they operate with modern technology. One door leaf in each pair of doors is outfitted with Ellison's overhead, concealed PowerNow power operator. This enables the doors to be mechanically opened by patrons when necessary. In addition, Ellison's power operation can functionally synch with a building's fire control system. When triggered, the doors automatically open and remain at their full 90-degree hold-open position until manually reset. "Ellison balanced door systems are most often specified because of their style and longevity," says Mark Graves, president of Ellison. "They are a combination of old and new – timeless and time-tested materials that allow our doors to withstand traffic far into the future. Old Point Bank is an ideal example of the delicate balance of old and new."